Written by Jeffrey Kaufman. Posted on April 10, 2018. What do employees need to know about safety in the workplace during severe weather? The Michigan Committee for Severe Weather Awareness (MCSWA) has designated April 8, 2018 to April 14, 2018 as severe weather awareness week. All businesses, organizations, families, and individuals are encouraged to participate in a statewide tornado drill at 1:00 p.m. ET on Wednesday, April 11. Severe weather in Michigan was responsible for 5 deaths last year. Severe thunderstorms, flooding, and tornadoes also caused about $220 million in damages. MCSWA recommends creating an emergency preparedness kit, developing a family communications plan, listening to a NOAA Weather Radio (or commercial radio/television), and being aware of the danger signs indicating a tornado. Warmer temperatures and unstable air make conditions for severe weather likely. Thunderstorms, high wind gusts, hail, tornadoes, flooding are all possible in Michigan. Falling tree limbs and downed power lines also present danger. 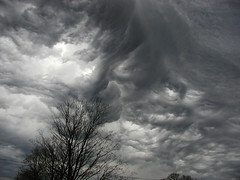 Most small businesses do not have a plan for severe weather. Unless the roof is collapsing, employees are expected to work uninterrupted. There is no excuse for not paying attention to dangerous weather and safety must come first. We encourage all Michigan employees to keep their eyes to the sky and stay safe. Photo courtesy of Creative Commons, by farlane.